The status of ichiran ramen in the eyes of Japanese and foreign tourists is self-evident. The bone soup is thick and the noodles are delicious. It is the best food for senior diners who would rather have to queue up! Now Hommi brings a touch of instant noodles to the friends at home. Let you taste the authenticity of ichiran ramen noodles even at home. Step 1: One pack of ramen with 500ml water into the pot, two packs with 1000ml, and so on. If you like the rich flavor, the water can be a little less appropriate. Step 2: Put the bread into the water after boiling, usually cook for 2 minutes and 30 seconds. If you like the soft noodles, you can extend the time. Step 3: Put 1 seasoning package and 2 oil bags in sequence and stir it. eggs, meat and other ingredients (self-prepared), you can get it. Since the instant noodles are fragile products, shocks and friction occur during international transportation. It is normal for food to be broken in the package. Of course, it does not affect consumption. Hommi will try best to avoid that in the packaging process. please avoid the compensation of Hommi. Please understand. Please pay attention to the parents carefully consider the order, thank you. 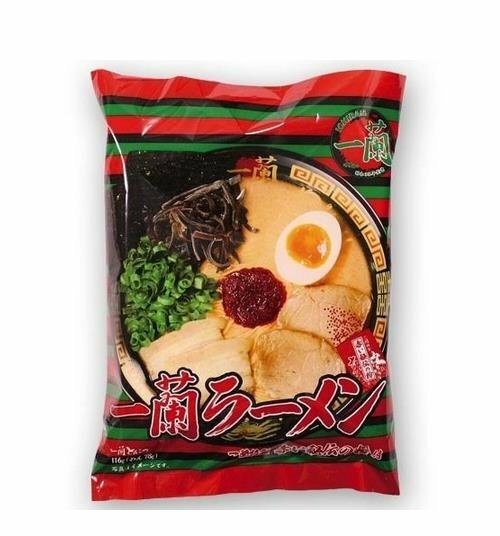 Shop Japanese populer Ramen "ICHIRAN" instant noodles one meals116g online at Hommi.We ship worldwide,free International Shipping over 8000 yen.See Price, Brand, How to use, Images, Customer Reviews, Questions & Answers for Japanese populer Ramen "ICHIRAN" instant noodles one meals116g.Customers who viewed this item also viewed Itsuki Food Kumamoto Red Spicy Ramen 114g,Marutai kyuusyuu pork bone soup Instant noodles 4types,Marutai whole eating Kyushu 7flavors*14bags,Fujiwara noodle crab spree 3flavors,IPPUDO hakata ramen box type.You can also buy stretched noodles and more ichiran at Hommi.